King Paimon is easily one of the most powerful demons, commanding a massive 200 legions of followers. He has a loud, booming voice and a very strong presence, yet his appearance is said to be very feminine and gentle. Summoning or conjuring King Paimon is more involved than the summoning of many other demons, but at the same time he is more powerful than many other demons, so only advanced conjurers should attempt to contact Paimon. Those who properly summon him may learn a great deal from him, including a deeper understanding of the mind and the secrets of earthly elements. Paimon may also offer the services of spirit helpers and can bind these creatures to the conjurer as familiars. In order to do complete a proper invokation, the summoner must look to the Northwest (as this is the direction of the House of Paimon) and must answer the demon's request or question in order to receive gifts of power or information in return. A sacrifice is also necessary to appease this king among demons. What exactly that sacrifice should be remains unknown, which is one more good reason to leave this particular demon alone unless you are highly experienced in summoning practices (which is far beyond the scope of this website, by the way). Paimon is rarely alone. He rides with a procession of demons before him, playing musical instruments to announce his arrival. 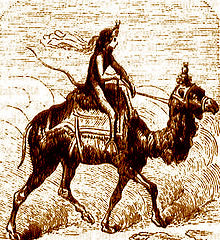 Paimon himself wears a crown and rides on the back of a camel. If the summoner calls upon them during this processing, two other demons named Beball and Abalam will join the procession as well. His legions are those who followed him from the Order of Angles and the Order of Potentates. Return from Paimon to the List of Demon Names.